Chengdu, China, July 13th, 2016 – Over 80 representatives from China Chamber of Commerce of Foodstuffs and Native Produce (CFNA), the Roundtable on Sustainable Palm Oil (RSPO), WWF China, China-ASEAN Environmental Cooperation Center, and Chinese palm oil production and trade enterprises gathered in the Sustainable Palm Oil Supply Chain Forum held in Chengdu, Sichuan Province, China, to discuss the challenges and opportunities in promoting sustainable palm oil supply chain in China. In 2016, 9 new members in China, including major sustainable palm oil importers such as Sinograin Oils Corporation, joined the RSPO. 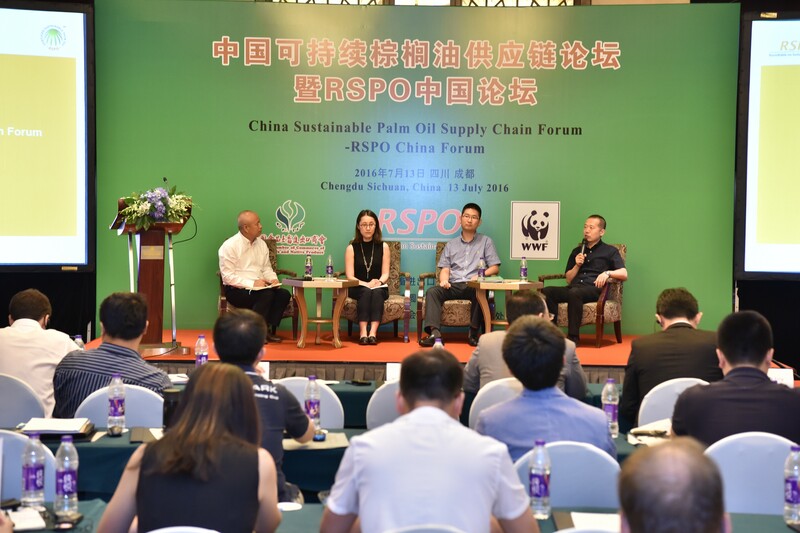 The total number of RSPO members in China has reached 52. Among these members, Sinograin is a large key state-owned enterprise whose establishment was approved by the State Council, is a significant implement for China to adjust the grain market. Sinograin’s great impact on China’s agricultural product and food sector allow the cooperation between Sinograin and the RSPO to have a positive and deep influence on the promotion of sustainable palm oil in China. Mr. Wang Zhigang, General Manager of Public Relations & Government Affairs at Julong Trading Co., Ltd., said: “Julong has planted more than 60,000 hectares of oil palm in Indonesia out of its total land reserve of 200,000 hectares. Julong will operate plantations in Indonesia with RSPO standards, not only meeting local laws and regulations, but also paying great attention to hiring local staff to help local community economic development, respecting local culture and religion, which gains our overseas business more opportunities for development . " “As one of the companies that actively advocates for the RSPO sustainable palm oil certification, Mars has achieved 100% RSPO Mass Balance sourcing. We have also participated in numerous activities which promote sustainable palm oil in China. At the same time, Mars actively educates our suppliers and associates on the importance of using sustainable palm oil, company practices sustainable development strategy, gaining employees’ passion to the company, increasing brand awareness and market share, and therefore gaining long-term stable returns from sustainable investment. We hope more business gathering with the practice of sustainable development strategy.” said Ms. Wang Yueyue, Sustainable Procurement Manager of Mars, which owns brands including Dove and Snickers. Mr. Jason Clay, SVP, Markets and Executive Director, the Markets Institute at WWF-US gave the closing comments from the perspective of global sustainable development. He indicated that WWF started its work on sustainable palm oil developments in the 1990s. Sustainable palm oil development is an issue of continuous improvement which requires the joint efforts of everyone. No one is big enough to change the industry alone. However, as a big consumer and importer of palm oil, China, if it can create an alliance and form a unified effort to create a single voice, can make a big impact on the sustainability of the industry. Jointly organized by CFNA, RSPO and WWF China, this international forum was attended by government agencies, media, traders, processors, manufacturers and retailers. Representatives from many global companies were present, including Wilmar, COFCO, Julong, Mars, HSBC, Unilever, Procter & Gamble and L'Oréal. In response to the urgent and pressing global call for sustainably-produced palm oil, the Roundtable on Sustainable Palm Oil (RSPO) was formed in 2004 with the objective of promoting the growth and use of sustainable oil palm products through credible global standards and engagement of stakeholders. The seat of the association is in Zurich, Switzerland, while the secretariat is currently based in Kuala Lumpur with satellite offices in Jakarta, London and Beijing. RSPO is a not-for-profit association that unites stakeholders from seven sectors of the palm oil industry - palm oil producers, palm oil processors or traders, consumer goods manufacturers, retailers, banks and investors, environmental or nature conservation NGOs and social or developmental NGOs - to develop and implement global standards for sustainable palm oil.